The original concrete floor and brick walls add historic authenticity to the Midtown loft. 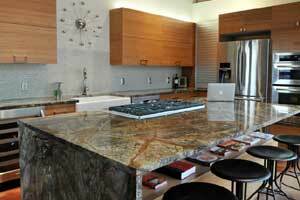 Rainforest granite counter topsadd artistic drama to a sleek and modern designed kitchen. A retro-modern clock serves as a focal point and accent for the simply decorated kitchen. The floating bamboo vanity in the bathroom is topped with Carrara marble. Rob Lewis immediately fell for the downtown lifestyle after moving to Oklahoma City from Corpus Christi, TX two years ago. He lived at the Sieber Hotel for a year-and-a-half until moving into his new renovated home. When it was time to purchase a home, Lewis looked at both old and new houses and condominiums. Ready to take on a project, he settled on a lofty space with a storefront view of Hudson Avenue, a unique building full of possibilities in Midtown. Some may remember the two-story red brick building just west of the Federal Building; it was the long-time home of Allen’s Café. Built in 1928, the building was originally used as a plumbing supply store. Midtown was definitely his first choice. “I like the Midtown area because it’s so easy to walk to restaurants and shops and it seems entertainment literally comes to you,” says Lewis. Marva Ellard, the owner of the Sieber Hotel and an urban developer, helped Lewis locate his new home near and also served as his general contractor on the renovation. Rob started the design process with Ellard and his cousin, Walter Antin III, a Parsons School of Design and Harvard Architecture graduate based in New Orleans. The building was originally designed for two living spaces with the owner on the ground floor and a second living space on the second floor. Both spaces are approximately 1,500 square feet. Ellard’s experience with historic buildings was instrumental in restoring the unique features of this building, especially the storefront. While some of the original material remained, tremendous care was taken to restore the front façade. Jo Meacham, owner of Urban Kitchens, and designer Michale Stapleton created a kitchen that was both modern and functional. Lewis knew he wanted a modern feel for the interior and says he got a lot of functional ideas for the kitchen from his brother’s condo in Washington D.C.. He was also sensitive to the age of the building he had chosen. “Regardless of the modern touches we added inside, you are never unaware that you are standing inside a nearly 100 year old building,” he says. The upper kitchen cabinets are hinged and fold up, unlike traditional cabinets which open outwards. This allows for larger cabinets in a smaller space. Each appliance was carefully selected and strategically placed to insure that the function and flow of the kitchen was easy and accessible. Bamboo was chosen as the material for the bathroom cabinets. The under-cabinet lighting gives the cabinets the impression of floating above the tile floor. Behind the vanity, the original glass block window was used to create a focal point with an area for green plants, softening the modern edge of the room. Stapleton worked closely with Lewis in completing the interior design and finishes for both the upper and lower spaces of the building. The original concrete floors remain with only a polish to make them shine. The original red brick walls remain in place and sheetrock walls were used to create interior rooms. Rob Lewis is now the proud owner of a loft with an amazing storefront view of downtown Oklahoma City, and says he couldn’t be happier with the results. His property also has some room for new construction. The possibilities are endless. A grocery store. Now, that’s a great idea.